Philanthropist and professional equestrian rider, Georgina Bloomberg, is swifter than the wind and more caring than Mary Poppins. Known for her sensational equestrian skills, Georgina is a passionate and determined woman, who spends most of her time training to become one of the top riders in the world. When she is not being a superb rider, she swaps out her cape to become supermom, caring for her son, Jasper. Aside from riding and being a mother, Georgina shares another passion for charity and giving back to the community to provide people with opportunities, which she had growing up. Her charity work with The Rider’s Closet, which she founded in 2006, and her advocacy in animal welfare issues transforms her into a wonder woman in all aspects. 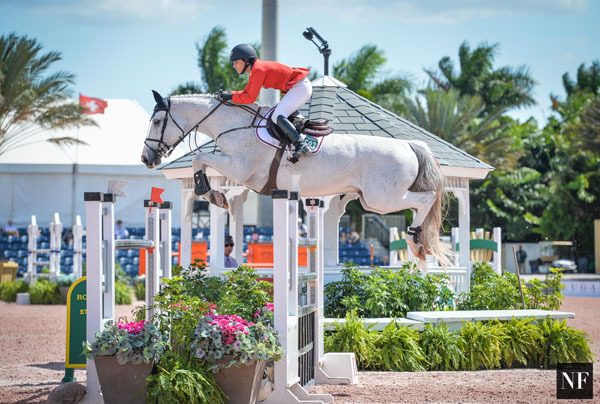 Here, Resident Magazine sat down with the charismatic and spry Georgina Bloomberg to discuss her passions, how they came about and her favourite vacation destination Bermuda. Q: How did you develop your passion for horseback riding? A: My mother who was English always rode growing up in England. She always wanted my sister and I to try it and be around horses. I always looked up to my sister and wanted to do everything she did so when she began to take lessons I did too. I actually didn’t like it in the beginning. I was terrified but I was too stubborn to give it up. Q: How old were you when you started? A: I was four when I started riding and six when I started competing. Although I was riding more I still didn’t love it. It was when I began competing that I fell in love with it. I enjoyed being able to show off what I spent so much of my time training for. Q: When did you celebrate your first win? What did you feel? A: I remember this feeling of understanding the harder you work at home, the more satisfying it is to compete. My first major victory as an adult was in 2002 at the North American Young Rider Championships. It was actually the first time I had started working with a new trainer and we decided it was important to have a goal every year. As a little girl I had always dreamed of being a part of The North American Young Rider Championships. My goal for the year was to be a part of the team. Together we made that our priority. I worked incredibly hard; I was extremely sore everyday and exhausted. I put more work into that achieving that goal than I had ever put into anything in my life. I was able to go to the championship and win a gold metal. It was the first time I understood if I really set my mind to this and put in the work I can accomplish anything. Setting goals motivated me, regardless if they were high or low. Sometimes you meet them and sometimes you don’t. But, you certainly can’t accomplish them if you don’t set them. I’m happy I learned this at an early age. Q: What hours were you putting in per week when training? A: We ride six days a week; occasionally more or less. To do it the top level you really need to do it six days a week for a couple of hours a day. Q: Do you have to be a certain age? A: They have a leadline, which is a horse show class for kids age 7 and under. It depends on the divisions. Q: Tell us about the upcoming Hampton Classic in August and The Rolex Central Park Horse Show in NYC in September? How did you get involved for our readers that might not be familiar with them. A: The Rolex Central Park Horse Show is a great horse show. The park show is boutique and smaller; it’s more of an exhibition over a couple of days. The Hampton Classic is our local show now. The show draws such a huge crowd and attention. It really makes a difference when you’re riding to have so many people in the stands cheering you on- whether it is family or friends, even people that have never been to a horse show before. The engagement from the crowd is important to us as riders. It allows us to showcase our sport and the horses through a beautiful setting. I love being out there. Q: Tell us about The Rider’s Closet you founded. A: When I was at NYU I met a girl who wanted to join the equestrian team but couldn’t because she couldn’t afford the clothes to ride. It really is a sport where you need to have the proper equipment to ride. The clothing is incredibly expensive. I had a lot of riding clothes that were still in good condition that I just outgrew. I didn’t know what to do with them; they just sat in my closet. The same was true for friends of mine who had gone off to college and stopped riding. I began to think that I know so many people that are not using their clothes anymore and this girl is probably not the only one who was unable to join because she didn’t have the proper clothes. I began to send boxes of clothing that I collected to intercollegiate equestrian teams. Before you know it, it had grown and I couldn’t keep up with all the boxes and requests. I needed to be able to expand. It’s now run out of Pegasus Therapeutic Riding. It was something I needed to step back from a bit so it could grow into what I always envisioned. It helps thousands of riders stay in the sport. It’s been incredible. Q: What are some current projects your working on? A: I’m really concentrated on competing for the summer. It’s a busy season until the fall. 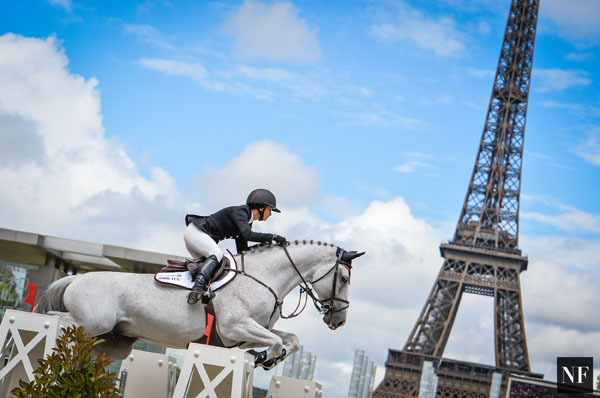 We travel for a majority of the summer competing on The Longines Global Champions Tour. My son comes with me. I really want to take advantage of being on the road and travelling to great places while I focus on competing. Q: What are some of your favourite spots in the Hamptons and what do you love most about the Hamptons? A: I don’t spend too much time in the Hamptons, although I do love it. I enjoy the lifestyle, visiting friends, and the beach. I love that they allow you to bring your dogs to the beach. That might be the best thing about the Hamptons. When I am there I wake up every morning and take the dogs to the beach and then head to Golden Pear for breakfast. That is my ideal way to start the day. Everything is so close. The house that I rent is in Bridgehampton; just around the corner is Almond, a French bistro that serves creative dishes. There is also one in city around the Flatiron district. I love it; it’s probably my favorite restaurant. Q: You picked this area to live because the park i s across the street for your dogs, is this true? A: I did and I also love Central Park. I grew up on the Upper East Side and I moved downtown for a few years, which I hated. I knew I always wanted to live in the Upper West Side. Now that I’m here I am absolutely obsessed with it. I will never leave. Especially now it’s great to have the park right across the street for my son. Q: Can you tell us about the Friends of Finn committee dedicated to fighting puppy mills that you are part of? A: Friends of Finn is now Humane Generation/Friends of Finn committee. The idea is to focus on all sorts of different animal rights and animal issues. It originally started as Friends of Finn with a main focus on puppy mills. We wanted to be able to expand on other issues as well. Now with the support of the Human Society of the United States, it does a little bit of everything for different animals. Q: What would you describe your personal style to be? A: I was a tomboy as a kid. Now, I think I’m very New York; I like black; I don’t like pink; I tend to be your typical New Yorker and I like that look. I wear jeans a lot. The majority of my time I am either in riding or workout clothing. I appreciate being able to get dressed up. A: Yes, I actually just got back from there. We spent summers there when I was a kid because my godparents used to live there. It’s very much a place of childhood memories for me and I know it very well. We have a family home there now which I make an effort to go to as much as possible. I just think it is great being able to go to the beach and getting away from people for a while. It’s just so beautiful, peaceful and quiet; it is my happy place and my ideal vacation. It’s nice just to be able to take a bunch of friends and hang out there. Q: Do you have a favourite restaurant there? A: My favourite is the Tuckers Point Beach Club. It’s on the ocean, the food is very good and you can have the kids running around on the beach. I think it’s also my favourite because it’s very casual and outdoors. Q: Would you ever want to follow in your dad’s footsteps and pursue a career in politics? A: Who wants to be a politician? Q: Did he ever ask you or your sister? A: My sister used to work for his campaign. She’d definitely be the politician of the family. Q: Is it something that she did because she was trying to help dad out or does she like it? A: I could see her doing it. I think she really enjoyed it and wanted to do it. She would be a much better fit. Nobody ever asked me; they knew I’d be terrible at it. Q: How has being a mom changed your life? A: I’ve always wanted to be a mother. I used to joke that taking care of animals is just another bowl at the end of the food line, which in so many ways it is. Anybody who has pets understands that if they are sick in the middle of the night you get up and take care of them. When you wake up in the morning you feed them before you feed yourself. It stems from the idea of putting someone else’s needs before your own. It’s just as good as I ever thought it would be. All the stereotypes are true. It has been a surprise for me. I never thought I would be the cliche, but it’s true. I still love riding and I would say in some ways my life hasn’t changed that much. On the other hand I understand now how much more fun it is to stay home with him on a Friday night than go out. He’s changed me in a lot of ways from being more of a homebody to putting things on the back burner so I can spend more time with him. He’s so fun. Q: Do you think he will ride? A: I am not going to push him into it, if wants to ride he can. It’s something I would be supportive of if he wanted to. But, I would be completely ok if he didn’t. Q: Do you purchase your horses for breeding purposes? Is that something you would consider? A: I’m not looking to get into the breeding, but we do a little bit of it. Generally each mare I have will have one baby. You can have one hundred babies and you’re lucky if one is good. You need a completely different kind of facility. On the competition side there are certain bloodlines and breeding that you have to have to be at that top level. It’s a really difficult thing to get into morally and it’s not something I’m interested in doing. If it was just a matter of getting a good mother and father together then our lives would be much easier, but it’s not. I do it on a very small scale, and if they’re not good they are still part of the family. Q: If you weren’t in the riding business what do you think you would do? A: I think I would do something with design. I was very artistic growing up. I wanted to go to art school, but it was too much to balance art and riding. Art school was something that needed all my energy; I was unable to devote the time it needed because I was riding. It was something I always held back from but it’s something I love. I would like to combine my passion for riding with design, maybe creating a lifestyle brand for women who ride. It would be nice to have something that transition from both worlds- Like ‘From City to Saddle’. I love competing, but it’s something that will eventually slow down. I won’t do it for the rest of my life. I want to put my all into it because I love it. When I am no longer able to do that I will be able to step back and do other things.